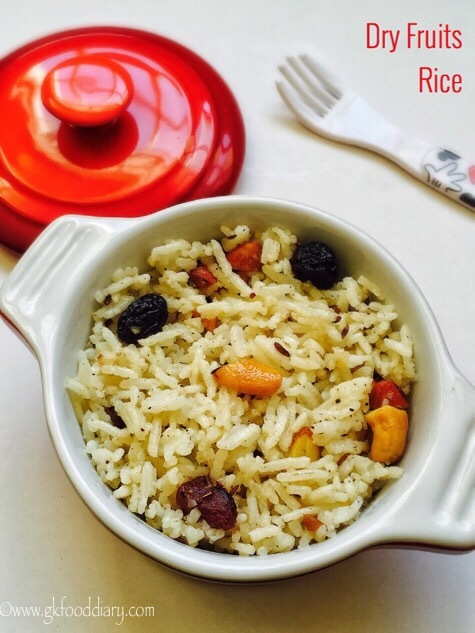 Dry fruits rice – easy and healthy rice variety made with rice, dry fruits and nuts. 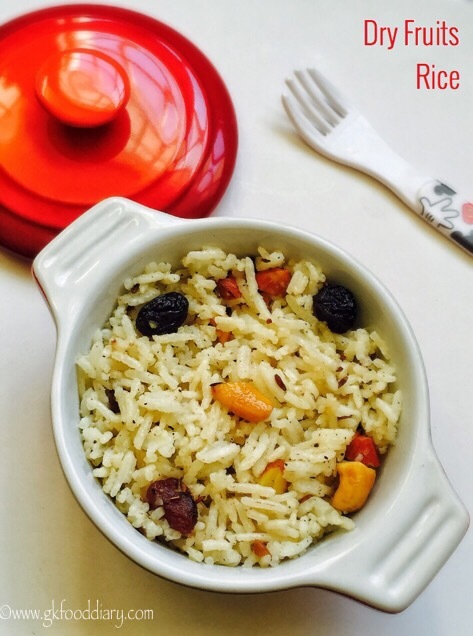 This dry fruits rice is a special rice recipe which can be served as a snack/dessert or even as a meal for toddlers and kids. I saw this recipe in a TV show long back and totally forgot about it. 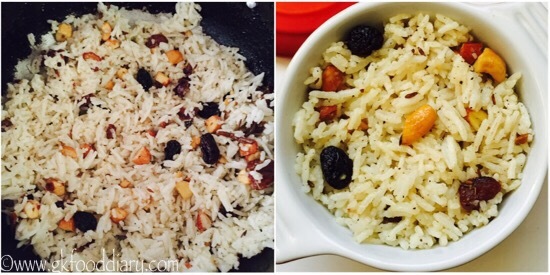 Last week when I was deciding the menu, suddenly I remembered this dry fruits rice recipe and tried it. It turned out so good and unique! 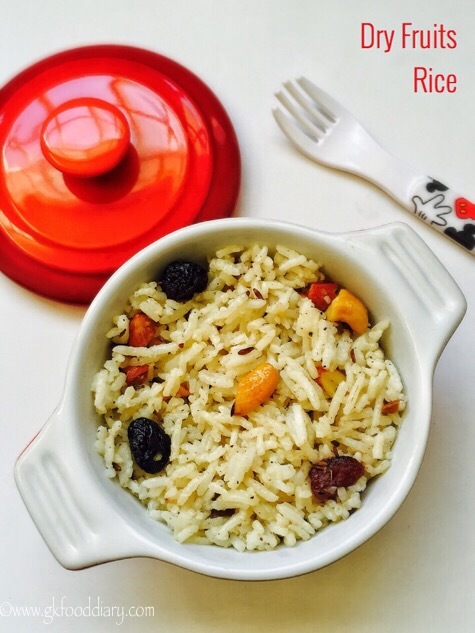 This dry fruits rice recipe is ideal for babies from one year. 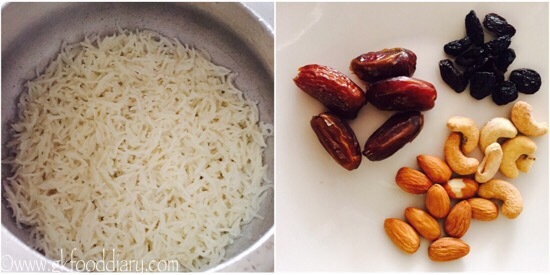 Here is how to make easy and tasty dry fruits rice recipe for toddlers and kids. 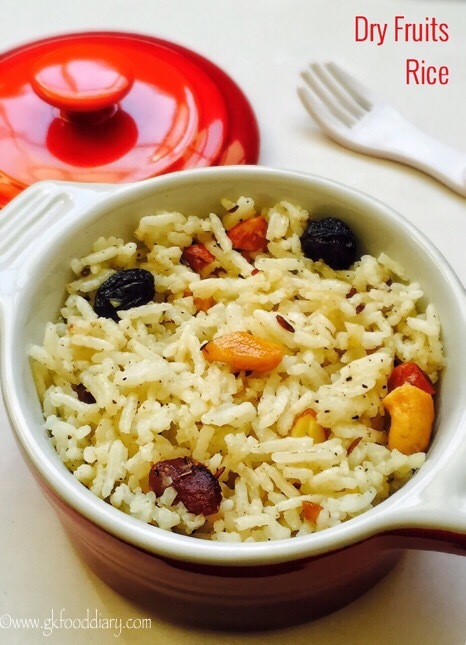 Dry fruits rice - easy and healthy rice variety made with rice, dry fruits and nuts. Measure and take the rice in a pressure cooker. Wash the rice well and soak it for 10 minutes. Then add ½ cup of milk and ½ cup of water. Pressure cook it for 3 whistles in medium flame. Open the cooker and fluff the rice with a fork once pressure released. Measure and take all nuts & dry fruits. Chop the nuts and dry fruits roughly, keep it ready. Heat a pan with ghee, add cloves, cardamom and cumin seeds. Let the cumin seeds cracks. Then add in all chopped nuts and dry fruits. Mix everything together for 2 minutes or until it shrinks. Then add the cooked rice along with pepper powder. 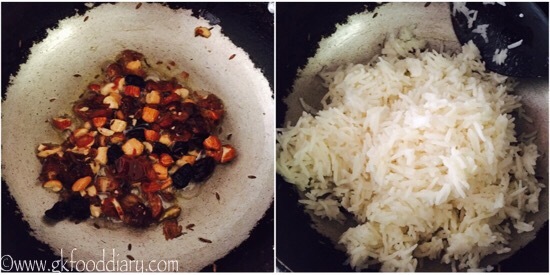 Mix the rice well with the fried dry fruits. Switch off the flame once done. 1. Measure and take the rice in a pressure cooker. Wash the rice well and Soak it for 10 minutes. Then add 1/2 cup of milk and 1/2 cup of water. Pressure cook it for 3 whistles in medium flame. 2. Open the cooker and fluff the rice with a fork once pressure released. Measure and take all nuts & dry fruits. 3. Chop the nuts and dry fruits roughly, keep it ready. Heat a pan with ghee, add cloves, cardamom and cumin seeds. Let the cumin seeds cracks. 4. Then add in all chopped nuts and dry fruits. Mix everything together for 2 minutes or until it shrinks. Then add the cooked rice along with pepper powder. 5. 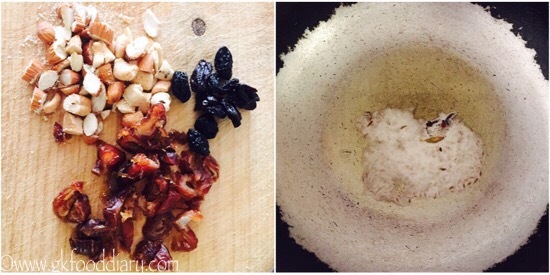 Mix the rice well with the fried dry fruits. Switch off the flame once done. The tasty dry fruits rice is ready! Serve with warm milk! Dry fruits rice can be served with little warm milk. But it tastes great as such too. You can use any nuts and dry fruits of your choice. 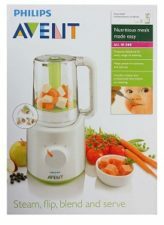 Don’t add whole nuts for small babies. I used basmati rice, you can use any rice variety based on the availability. The dry fruits rice shouldn’t be too mushy. Add water/milk accordingly. 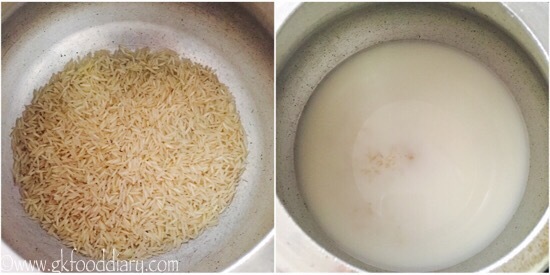 You can cook the rice completely with milk instead of water. Make sure to introduce everything separate to your baby before you try this dry fruits rice.